Want to make a lot of espresso really fast? 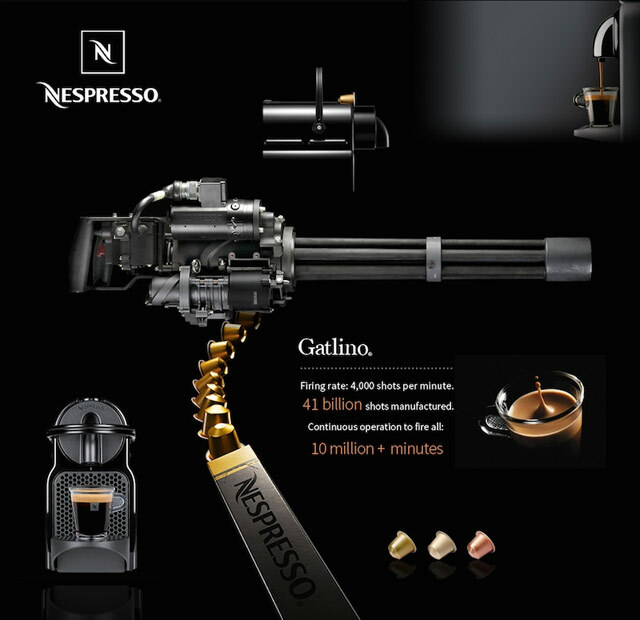 Enter the The Gatlino®, a machine gun that uses Nespresso capsules in place of bullets. It was during one bleary break-of-dawn that I found myself slouched over the machine making coffee and drifting into visions of the Nespresso hooked up to a belt of ammunition, or a machine gun being fed by a chain of Nespresso capsules. I’m not sure which. Doesn’t matter. What’s important is that it led me to wonder how long it would take to fire all the Nespresso cartridges ever made. The environmentally-conscious will be appalled. Which post should win this week's grant?